To promote research in Mathematics and Statistics done by undergraduate students. 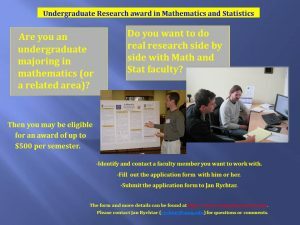 An award can be given to an undergraduate student majoring in mathematics or a related area that contributed to a research program of a Mathematics and Statistics faculty member. A student can receive the award multiple times but at most once per semester (Spring, Summer, Fall). One bigger project can be eligible for several research awards, but each award will be given only after finishing a clearly defined and substantial part of the project. There are no fixed deadlines for submissions but only up to 6 awards can be awarded by the department every year. A student identifies a faculty mentor(s) he/she is interested working with. Together they fill out the application form and submit to Jan Rychtář (rychtar@uncg.edu). A student presents the work at a conference. Currently, there is OUR Expo in the Spring semester, UNCG RMSC in Fall and REU presentations in Summer. A student is encouraged to finish the work on the project by writing Senior thesis, Honors project or a research article. Applications for URA or a Research grant could be submitted simultaneously with the application for the URAMS. URAMS can in effect provide funding for the student’s work while URA or grant application is in review. To apply please fill out and email Jan Rychtář (rychtar@uncg.edu) the PDF form.